Red and orange flowers are butterfly attracting. Also, serves as a host plant for Monarch, Queen and Soldier butterflies. Very showy, self seeds freely. We'd like to note that a specific aphid is attracted to this Scarlet Milkweed and will gather under the flowers along the stem essentially covering the stem. 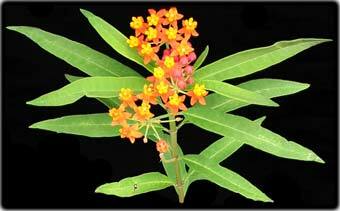 Not to worry, they only like plants in the Asclepias or Milkweed family and will not attack other species.